This data from the national United Way and 16 state United Ways documents just how extensive this kind of poverty is among those who work. This data goes deeper than federal poverty-level data, which leaves out many of these struggling families. In comparison maps, Axios demonstrates the clear differences. 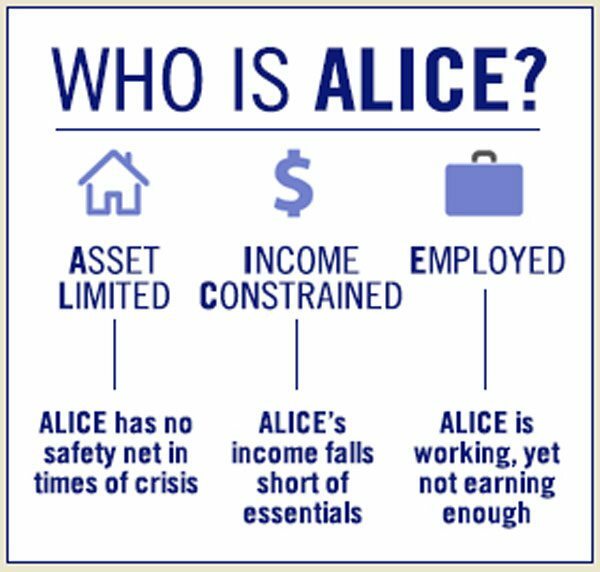 The usefulness of ALICE data and the focus of this ongoing United Way project as a tool for the nonprofit sector hold great promise. Based on this data, more than 40 percent of US households cannot afford basic living expenses of food, rent/housing, transportation, childcare, and a cellphone. These are people who live above the official poverty line but below the cost of these ordinary expenses. Based on the 2016 data, there were 34.7 million households in this group—double the 16.1 million that are in actual poverty, according to ALICE project director Stephanie Hoopes. 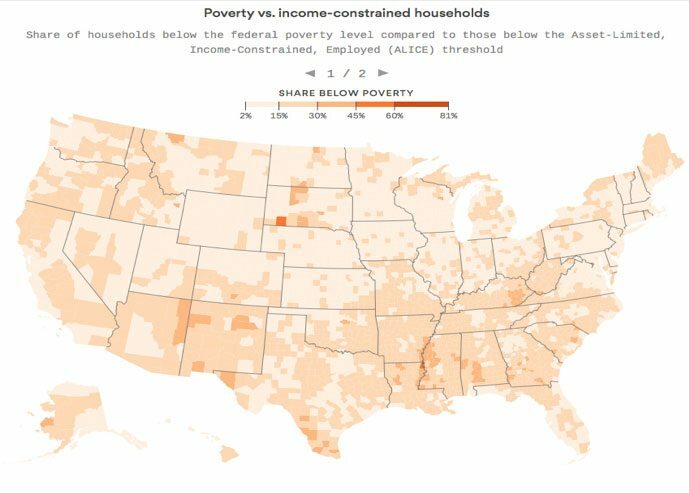 Add those in official poverty to those in the “ALICE” category, and it becomes clear that over 50 million American families fail to earn enough to fully meet their needs. “It’s a magnitude of financial hardship that we haven’t been able to capture until now,” Hoopes said. The purpose of this project and the usefulness of its data is clearly stated on its website: “The ALICE Project provides a framework and language for stakeholders to reassess public and corporate policies and implement changes that improve the lives of ALICE and their communities.” While it began with just New Jersey, exploring and quantifying the number of households there that were struggling financially, it has grown to 16 states. ALICE uses standardized measures to calculate state-by-state and county-by-county costs of a bare-bones household budget and then quantify the number than cannot even afford that. 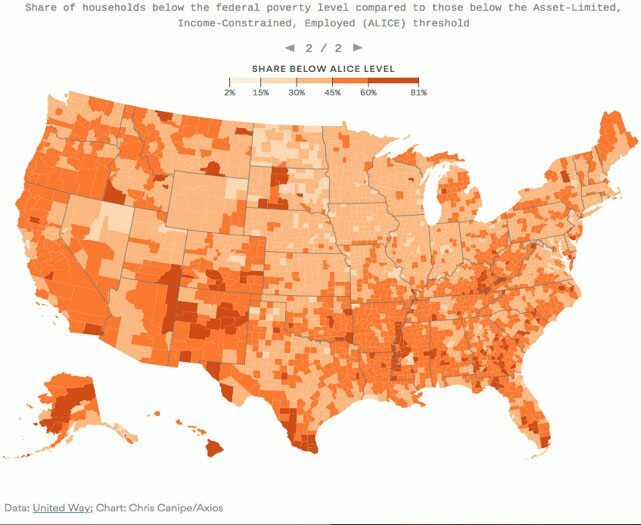 It raises awareness of those who are left out of the federal poverty level data. The ALICE Project produces reports that inform nonprofits, government, academia, and others. Data, as well as their research staff, are made available to those seeking information. It even conducts webinars on specific topics. 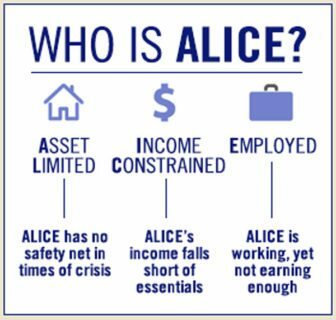 But the ultimate goal of the ALICE Project is to stimulate action that will lead to the financial stability of ALICE families and their communities. In a time when nonprofits are often asked, “show me the data,” here is yet another source that demonstrates that the working poor exist in greater numbers than the government data show. Using this data can make a difference, and through working with ALICE, perhaps we can change the dynamic so that the choices for these families will not have to be between paying rent, covering childcare costs, and buying food.